← Laundry Soap Social is nearly here! Occasionally, we have the opportunity to share a story of influence from one of our members that reminds us how we can all make an improvement – big or small – to another person’s life. This weekend, the son of one of our Sustaining Members has inspired us all to see a need and reach out in some way to fill it. 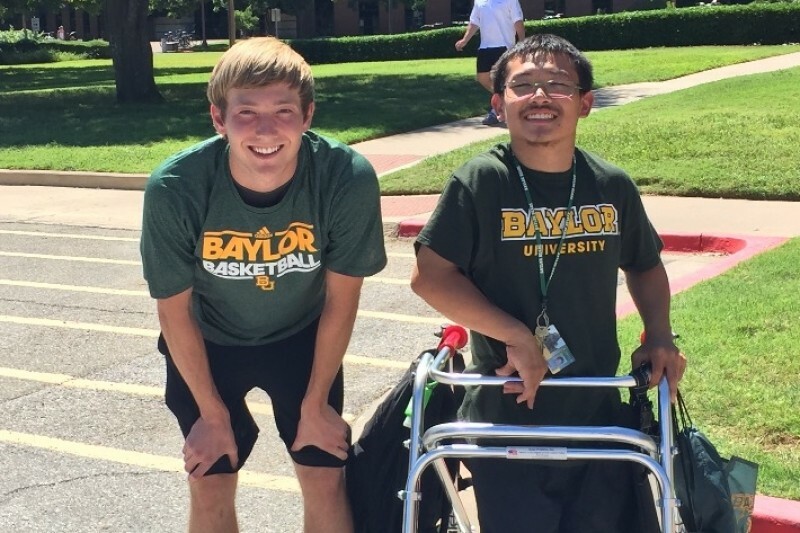 Please read Taylor and Tony’s story here to see how this Baylor Freshman has chosen not to ignore someone in need, but instead to really see the challenges another person is faced with and find a way to eliminate those challenges. I remember sitting in my hall’s first meeting on my first day of attendance at Baylor University in Waco, Texas, and while listening to the house rules, a young man with obvious physical impairments was sitting right in front of me, carefully balancing the weight of his body against his metal walker. As the fire chief closed discussion on fire exits, he raised his hand and asked what he was to do in case of an emergency; given his condition, getting out of the building quickly would not be possible. As the meeting went on, I then pondered how I could possibly deal with a Disease such as Cerebral Palsy and how difficult basic daily tasks that I take for granted would become. Little did I know later in the week I gained the opportunity to introduce myself, and a new friendship would quickly blossom. As conversation went on, he began to tell me more about Cerebral Palsy, I couldn’t believe what he was forced to go through every day. Just a little after the first week of school, I found myself walking back to my dorm in the piercing heat, doing my best to avoid the sun and sweating through my clothes. As I stepped onto the pavement, I looked up to see Tony, absolutely drenched in sweat, slowly staggering across the street with his book bags and backpacks swung across his walker. I ran up too him immediately and told him to go to the shade and that I’d be back to pick him up with my truck. After sprinting back to my dorm room and getting my keys, I found him in a shaded part of the parking lot covered in sweat and gasping for breath. I carefully helped him to the truck and eventually lifted him into the backseat and nestled his walker in the bed of my vehicle. We began to talk on the way back to the dorm, which is when I learned that it takes him 45 minutes to make it to his closest classroom from the dorms; which for me is about a five-minute walk. I also learned that he was missing the beginnings of class lectures as it took him an hour and a half to reach his furthest classroom. Every day he has to decide between eating at the cafeteria or going to his class, and some day’s he won’t have enough time to choose either. As I pulled up to the front of our dorm he said something that stopped me cold. He said, “You know, I really don’t have it that bad, with all things considered, things could be a whole lot worse. Honestly I’m lucky to have been effected by the diseases I have because I know a lot of other people who have it worse.” I’ve never been much of an emotional person at all, but it was hard to hold tears back as we began our slow descent to the second floor of University House. I was upset after hearing his story and immediately did everything I could to help him. I’ve contacted around ten different authority figures at Baylor trying to find a way to get Tony some transportation help and received just about the same answer from all of them; “I’m sorry there’s not much we can do, but if you want I can transfer you to someone else?” After making no progress through the University, I decided to take initiative myself and make something happen. I would not be writing this if I could be their every time to help Tony. Unfortunately, I can’t be with him all the time, so if we could raise enough money to buy him a “GoGo Traveller 4 Wheel Scooter” he would be able to attend every one of his classes and make it on time for the first time this year. When I talked to him about my idea his face lit up. He was extremely enthusiastic about the possibility of him being able to make all of his classes and also being able to eat without having to choose. With your guys’ help, his needs can be met and his years of experience at Baylor University can go from stressful and miserable, to the amazing experience he deserves as a college student. In one day, Taylor created a “gofundme” account and raised more than enough money to provide a better transportation option for Tony. The money came in small and large donations from people of all ages. If a 19-year old young man can make this kind of impact in just one day, so can we all! Let us all look around our community and choose even a small way to make a difference. There are many worthy charities to support. Hospitality House has recently requested food for their pantry (specific items listed here). The Pregnancy Care Center is in need of diapers in sizes 1, 2, and 3 (http://pcctexas.org/). The Senior Center of Walker County is always looking for donations to help fund their Meals on Wheels program. These are just a few of the many places in our community that would be happy to have your donation – big or small! If money is tight, look for a place where your time would be greatly appreciated! SEE A NEED…FILL A NEED!